My Passover blog is finally up and running! I have to be honest and say that for a full two years I have been wanting to write a blog that had something to do with my love for food. But what specifically? Every day on my to-do list was written “Write Blog!”, but having to take care of two small children full time has made starting anything new quite difficult. 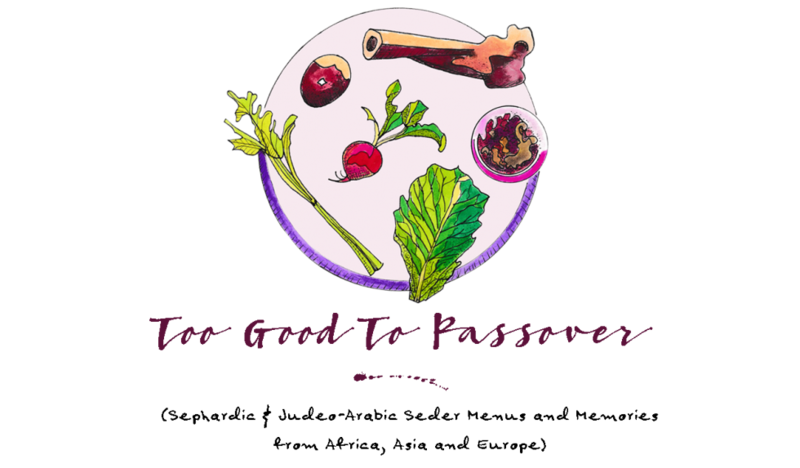 A few months ago I started to think about the blog again more seriously, and then the topic came to me — why not write a blog to match the other project on my list: “Finish Passover Cookbook!”? And so here I am, posting my first entry in a blog ever about Sephardic Passover food, traditions, and memories. For now I only have a couple of hours a day (usually during my kids’ naptime!) to do everything else that needs to get done (emails, laundry, dinner, cleaning, work stuff…), but I will do my best to keep to my blog as regularly as possible. Why a cookbook, and now blog dedicated solely to a Sephardic/Middle Eastern Passover? the commandment to eat special foods (such as the unleavened “cracker-bread” called matzah) or reject others (such as basic leavened bread), or consume symbolic foods as part of the seder meal (such as sweet charoset representing the freedom of our enslaved ancestors), gives food a central role in the holiday’s observance. Passover is also unique in that the holiday service takes place with family and friends of all generations sitting around a big table (or two) at home, as opposed to observing the holiday in a synagogue. As a result, seder customs and menus have become more elaborate and adventurous over the last ten years, with many families looking for new and alternative ways to weave in their old family traditions with more exotic and creative ones. For all of these reasons and more I felt it was necessary to not only write a cookbook that gathered all of the many delicious and exotic Sephardic Passover recipes from all over the world, but one that served as a reference-guidebook for the various traditions that went along with them as well. Most importantly, I wanted a book that preserved these traditions and special memories that are being lost with every generation. My decision to now write a blog that is dedicated to Middle Eastern/Sephardic Passover dishes, customs, traditions, and memories is to motivate me to continue and complete my Passover cookbook.